There are some things that every guitarist needs, but putting together a proper accessory kit can take some time. 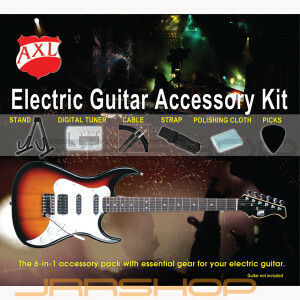 AXL offers you the chance to get everything in one place with the AXL Guitar Accessory Kit. Whether you are a beginner or a professional, you’ll get lots of use out of the Guitar Stand, Digital Tuner, Cable, Strap and Polishing Cloth. We’ve even included a half dozen picks so you’ll be ready to play as soon as you open the box. Priced individually, this kit would cost twice as much. We’ve put a useful accessory kit together for you, so the only work that you’ll have to do is on your chops!